LinkedIn Ads have been the red headed step child of social ad platforms for some time now. In their early days, they didn’t even have specific targeting options. Without anything other than a general audience to target it kind of felt like you were gambling. You basically gave them your money pulled the lever and kept your fingers crossed. Yep, just like that. So it’s no surprise that LinkedIn Ads have often been overlooked for more popular ad platforms like Facebook, Instagram, and Twitter. These platforms have robust targeting features, user-friendly interfaces, and typically boast a cheaper cost per click. But if you’ve turned a blind eye to LinkedIn in the past then now is the time to take another look. LinkedIn recognized the flaws in their platform and has been working hard to step up their game. Today LinkedIn’s Campaign Manager offers nearly all the features that the other guys do. In fact, it even has a few advantages over other social ad platforms you might not have considered. Since the platform was built for business professionals, people actually get on LinkedIn for work, not just to watch cat videos. Which means your ads are much more likely to hit their target especially if you work in the B2B sector. Which means you have a huge opportunity to generate new highly qualified prospects and nurture existing high-quality leads. In this article, you’ll learn how to attract more leads, get more appointments, and grow your business with LinkedIn Ads. We’ll take you from the basics on how to get started all the way to ongoing optimization and advanced strategies. After you finish this guide you’ll be a bonafide expert, so let’s do this! Before you can start running ads on LinkedIn you’ll just need to set up a standard account. Although it isn’t a requirement, if you’ll be running ads for your business then you’ll also want to create a business page. 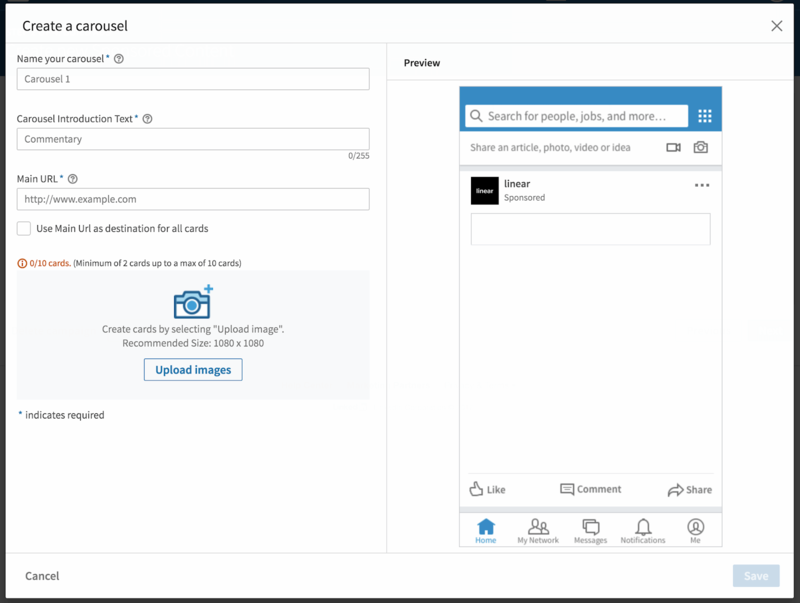 After you’ve created a business page you can start setting up LinkedIn Campaign Manager. However, I’ve found just getting to the campaign manager dashboard can be a little tricky. So just in case, here’s a quick step by step to get you into campaign manager from your business dashboard. 1.Click on the work tab in the top right corner. 2. In the pop-out menu, click on the square titled ‘advertise’. 3. Finally, click on the blue ‘Create ad’ button in the center of the page. Alright, you made it into campaign manager and now you need to set up your shiny new LinkedIn Ads account. To get started, click the ‘Create account’ button on the upper left side of your dashboard. Account name – This really isn’t too important unless you plan on creating multiple accounts so feel free to name it whatever you like. Currency – LinkedIn currently accepts 16 different currencies so just select the currency you’ll be using from the dropdown list. Here’s a list of all the currencies LinkedIn accepts. Associate a Company Page – Type in the name of your company page then select it from the list that appears. If you haven’t already created a page then you can use the link to create a new one before you continue. After you’ve completed all the required fields click save, add your billing information, and you’re all set! LinkedIn Ads don’t always look how you might expect them to. They have some unique placements and capabilities that you don’t see on other ad platforms. Here’s a quick breakdown the different ad formats you can choose. Sponsored Content – Similar to Facebook newsfeed ads, sponsored content ads appear on users desktop and mobile activity feeds. Dynamic Ads – Truly unique to LinkedIn Ads, dynamic ads are extremely personalized to each LinkedIn user. You can even opt to include users name’s in the ad copy itself.  Text Ads – Text ads can appear in two placement variations. They may be shown as a text only ad on the top of user profiles or on right hand side accompanied by a small image. 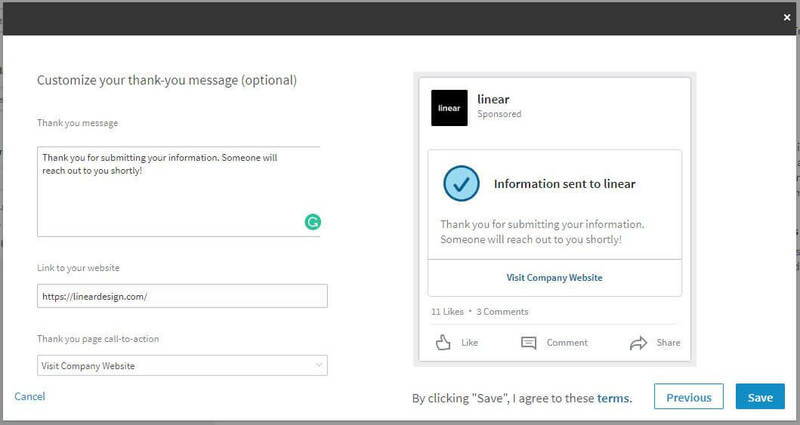 Sponsored In Mail – Also an ad format that is unique to LinkedIn Ads, sponsored in mail allows you to send personalized messages directly to users in your target audience. Choosing the right campaign will help you get the best possible results from your LinkedIn Ads. In the following sections, you’ll learn how to set up each type of campaign, and discover the campaign types that align best with your goals. In the campaign details section, you’ll choose a name for your new campaign. Then you’ll choose which campaign group it belongs to. Alternatively, you can create a new campaign group by clicking the link below the dropdown menu. Finally, you’ll pick your target audience language. Unlike other platforms, they don’t have an all languages option. Be sure to choose the language that your ads are written in and then click next. What do you want to accomplish with your campaign? In the third and final section, you can choose the ad format you want to use. If you chose to send people to your website or collect leads using lead gen forms then you’ll have three different ad formats to pick from. However, if you chose ‘Get Video Views’ then you’ll be limited to only one ad format. Creating ads in Linkedin is remarkably straightforward. After you’ve chosen the ad format you want to use you’re given the option to select from content you’ve already created or create new sponsored content. Promoting existing content is a great way to build social proof and attract more page followers. This is ideal if the goal is to get more followers and drive visitors to your blog. However, if you select from content that you’ve already created then you’ll be unable to customize your ad as much as you may like. Fortunately, you also have the ability to create new sponsored content. All you have to do is click the ‘Create Sponsored Content’ button. If you chose the article, image, or link ad format then you should see a pop-up like the one below. Here you can give your new sponsored content a name, choose an image, and write your ad copy. 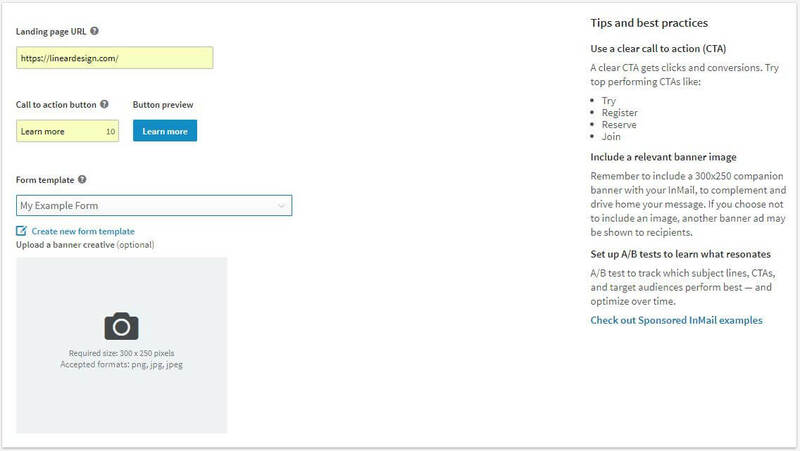 Then you’ll enter the link that you want to send users to when they click on your ad. The carousel ad format also allows you to choose from existing content, but only if the content is also a carousel. If you don’t have any existing carousel content then just click the button to create a new carousel ad. Creating a carousel ad is similar to the previous ad format with only one exception. Instead of only using a single image you have the ability to add up to ten unique images to your ad. This is a great opportunity to tell a story with your images and create more user engagement. 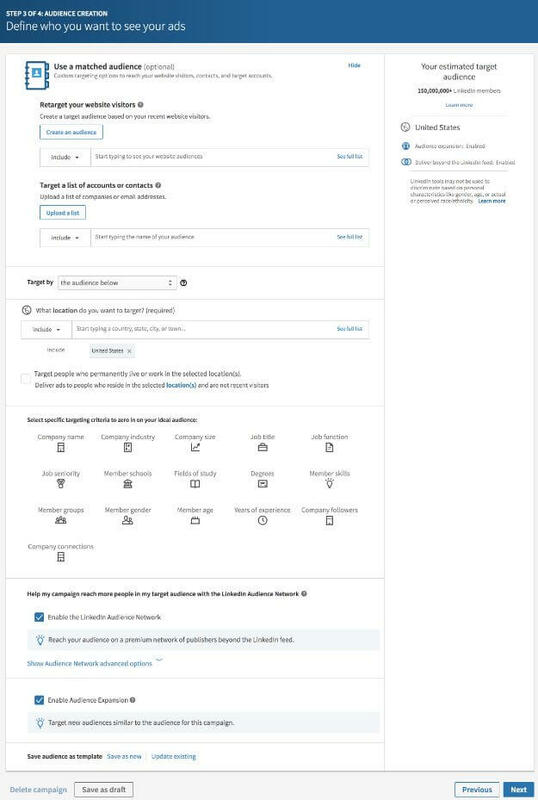 LinkedIn gives you the ability to select existing video content that you’ve already posted to your newsfeed. Like the other ad formats, you can also choose to create new video content. If you choose to create new video content you’ll see a pop-up like the one below. 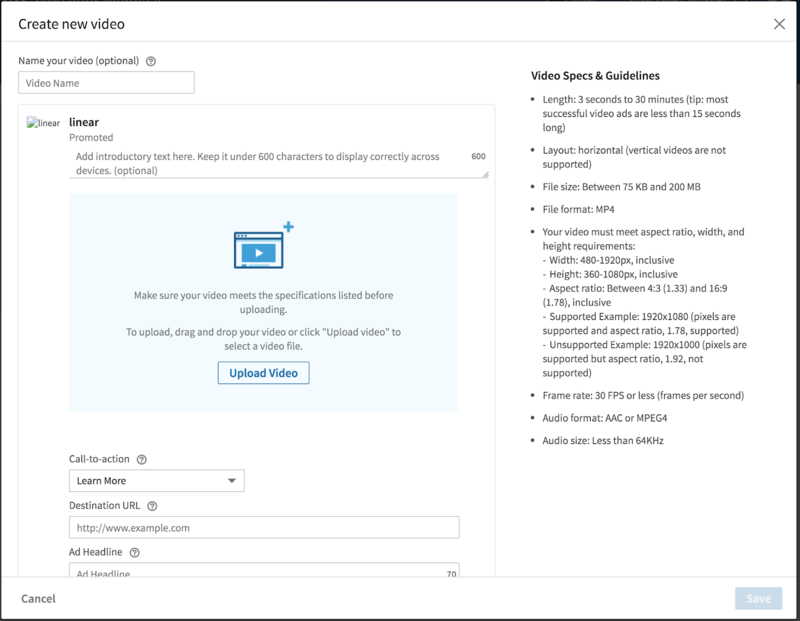 Unlike the two previous ad formats, LinkedIn Video ads have more options to choose from. Yes, you can name your new content, upload your video, write a headline, and enter your destination URL, but you can also select from several different call-to-action choices. Be sure to pick the CTA that is most relevant to your goal. For example, if you want users to download your eBook or get a quote then take advantage of those CTA options and put them to use. 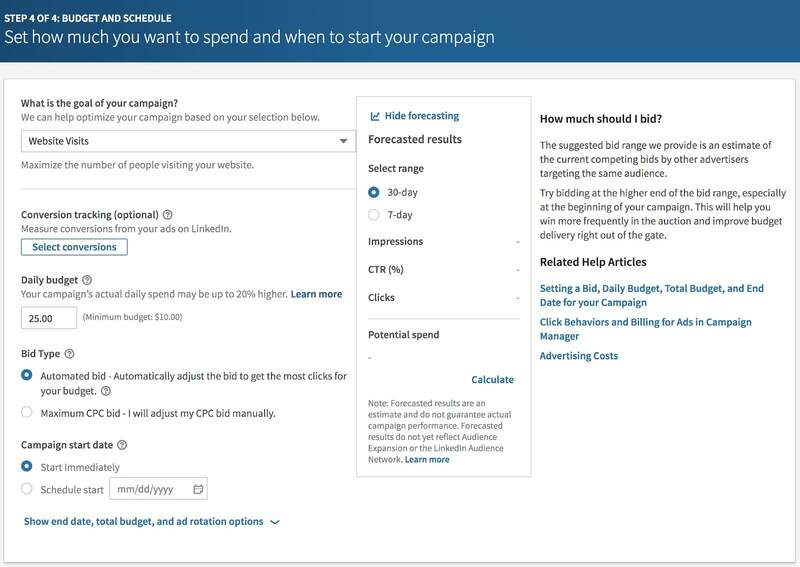 To create a Dynamic Ads Campaign you’ll follow the same initial steps to give your new campaign a name, place it in a campaign group, and select a language. Then you’ll move on to the second step as outlined below. What would you like to happen after members click on your ad? In the second step of creating a Dynamic Ads Campaign, you’ll be asked to choose from three different ad formats. Here are the different ad formats along with some best practices. To create a Job Ad you’ll start by entering your company name. Then you can select a premade ad headline or write a custom headline. Here are a few of the preset headlines you can use. %FIRSTNAME%, ready for your dream job? %FIRSTNAME%, need a new challenge? We can help! Next, you can pick from a list of Button labels or create your own custom label. Here are a few of the button presets you can choose. After you’ve followed the steps above your ad should be ready to go. Click the ‘Save’ button on the bottom left to move on to the next step. 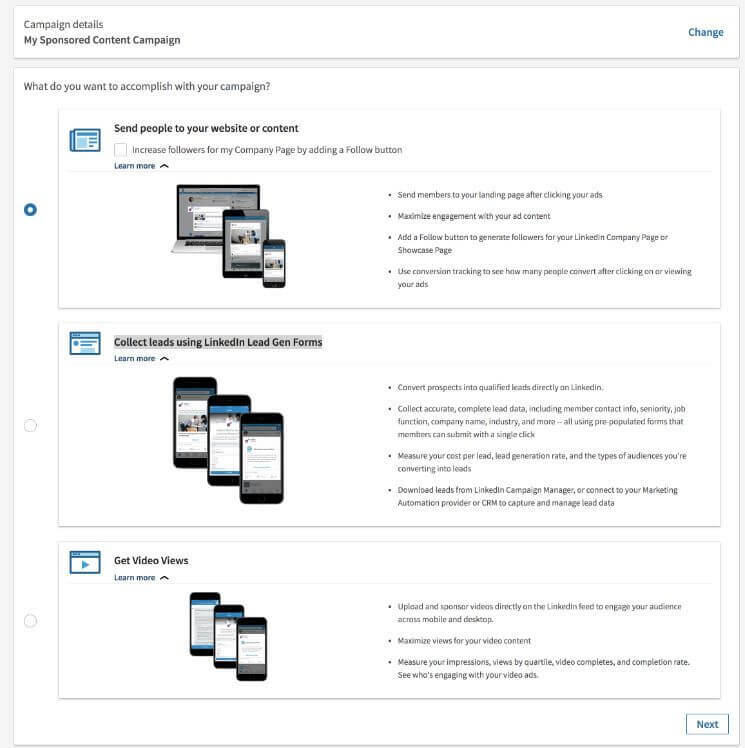 Because the last two steps are the same for all LinkedIn Ads Campaigns I’ve saved them for last, but you can skip ahead by using the link below. After naming your Dynamic Ads Campaign and selecting a language you’ll select the Follower Ad option to move onto the second step. Now you should see a screen much like the one below. You can choose from a list of descriptions presets or write a custom description. Here are the preset descriptions you can choose. Visit the careers page for [company name]! Visit the company page for [company name]! You’ve got the skills, we’ve got the opportunities! You’ve got the skills, [company name] has the opportunities! Next, you’ll fill in your company name and pick your Ad headline. Once again LinkedIn gives you some presets to choose from or you can write your own custom headline. Below I’ve listed all of the different preset Ad headlines you can select. %FIRSTNAME%, get the latest on [company name] news, jobs, and more! %FIRSTNAME%, currently recruiting in your sector! %FIRSTNAME%, [company name] is hiring! After you’ve completed these steps you’ll choose a Call-to-action from the dropdown. You can choose from the following CTAs. That’s it! Go ahead and click save to move on to building your audience. Spotlight Ads are very similar to the other two types of Dynamic Ads. However, you aren’t provided with any preset Ad headlines, Descriptions, or Call to actions. Keep that in mind when choosing to create Spotlight Ads so you can come prepared with some engaging ad copy. Additionally, you’re given the option to use a background image for your Spotlight Ad. Keep in mind that uploading an image will disable your ad’s description and the user’s profile image. So it may be a good idea to test this against a variant without a background image to decide which ad performs best. 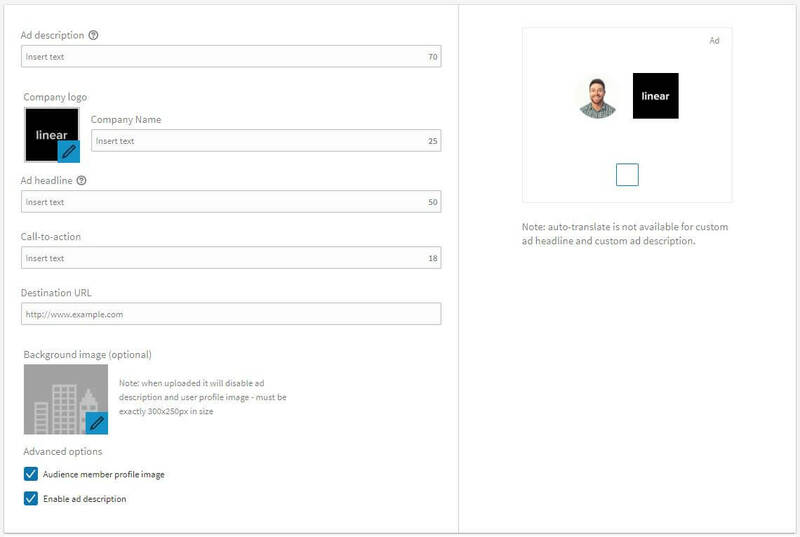 If you choose not to use a background image, but still want to remove the user profile image and ad description then you can do so by unchecking the boxes at the bottom of the page. That’s it for creating a Spotlight Ad. 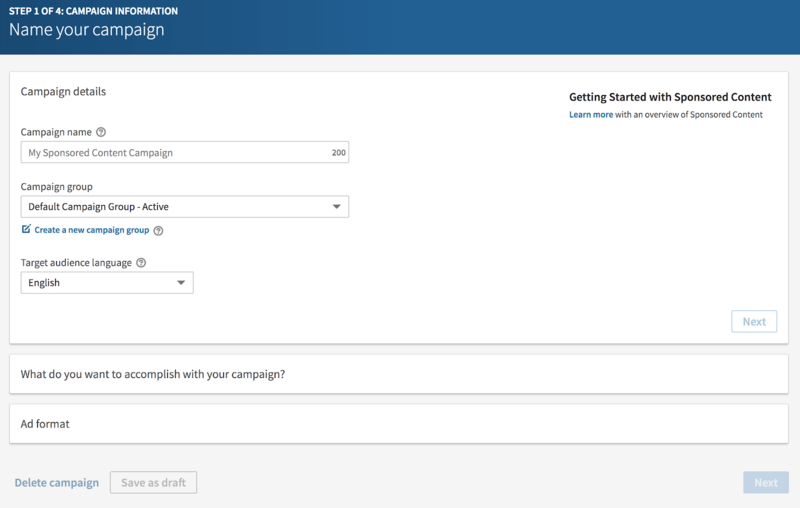 Click the ‘Save’ button on the bottom left to finish creating your campaign. You can keep reading to learn how to create text ads or jump to Step 3 Audience Creation to finish creating your Spotlight Campaign. Where should members go when they click your ad? This is the first and only step that is different from creating other campaign types. You’ll start by choosing where you want to send your traffic. You can either send traffic to your LinkedIn business page or to your website. Next, you’re tasked with writing a catchy headline, uploading an image, and adding some descriptive text. To get the best results from your text ads keep your headlines concise, use a strong call-to-action, and be sure to upload a high-quality image. Even though adding an image is optional you should make it a top priority. Ads that include images usually see about 20% more clicks than ads without images. You can read more about creating great ads in LinkedIn’s official guide. LinkedIn also provides you with a preview of what your ad will look like in all three possible formats. You can click through each tab to see how your ad will appear. Okay, you’ve created a Text Ad, click save to go to the next step and start creating your audience. Keep reading to learn about Sponsored InMail Campaigns or Skip Ahead to Audience Creation to finish creating your Text Ads Campaign. Unlike some of the other LinkedIn Ad Campaigns Sponsored InMail Campaigns are their own breed. Almost every step contains options and settings not seen in other LinkedIn Campaigns. So if you plan on making them part of your LinkedIn Ads strategy then you’ll want to follow along with the next few sections. Right from the start you can see a few unfamiliar choices. In addition to naming your campaign and selecting a language, you’ll also be asked where you want to send members who click on your ad. If you click on the learn more text under each option you’ll reveal some more information about each choice. With Sponsored InMail Campaigns you can choose to send members to your website or collect leads right on LinkedIn with Lead Gen Forms. Each option requires a unique setup process so I’ve broken the next part of this guide into two sections. The first section will walk you through creating a Sponsored InMail Campaign that sends people to your website. 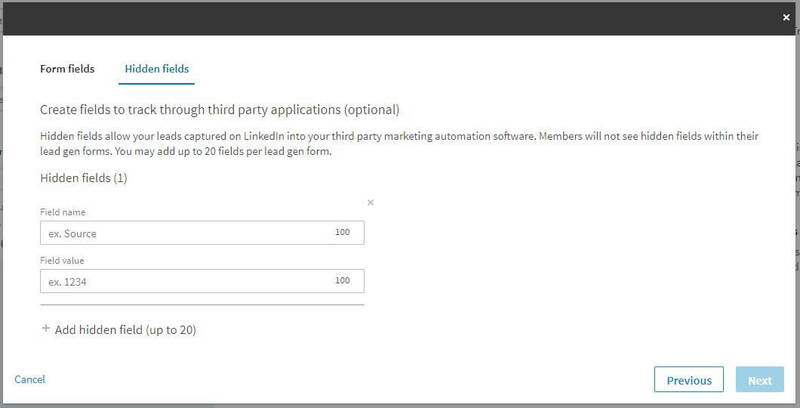 Then the second section will show you all the steps needed to collect leads using LinkedIn Lead Gen Forms. Start your new Sponsored InMail Campaign by giving it a name and picking a sender for the InMail itself. In this section, you’ll be writing the message that gets sent to members in your audience. First, give your message a subject that is personable and concise. Then create a customized greeting that uses the member’s name. To do this you’ll need to use some special placeholders that LinkedIn will automatically replace with each person’s information. 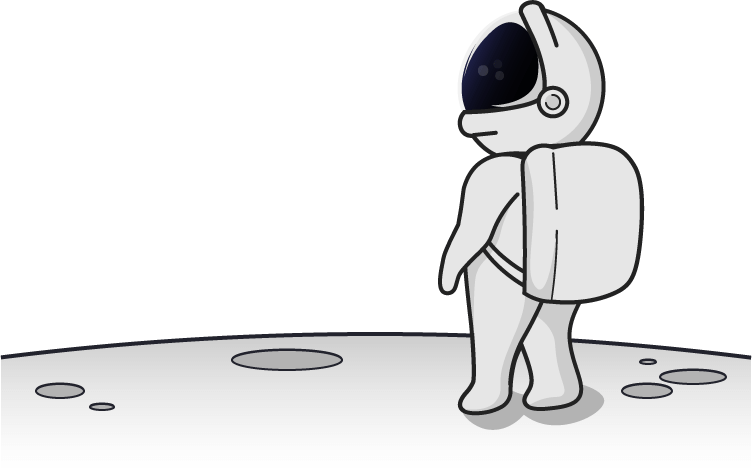 Here’s an example of a few placeholders you can use. %FIRSTNAME% – Inserts the recipients first name anywhere in your message. %LASTNAME% – Inserts the recipients last name anywhere in your message. For example, you could start your greeting with Hey %FIRSTNAME, or Hello %FIRSTNAME% %LASTNAME%, and LinkedIn will dynamically insert the members first and/or last name. So if your email is sent to someone named John Doe the message would appear as Hey John, for the person receiving the InMail. 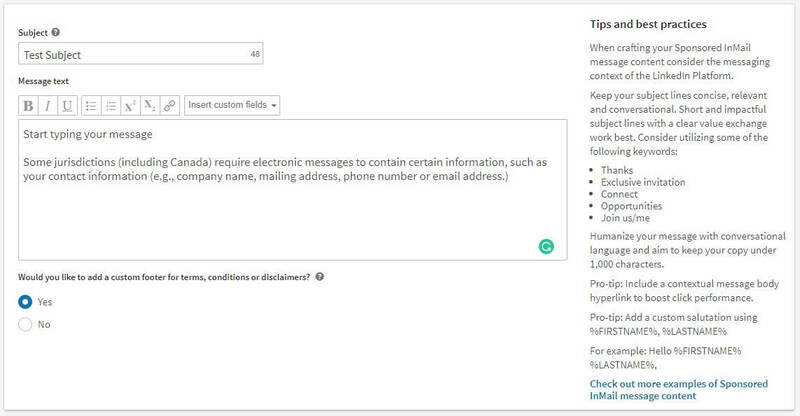 After you’ve completed your message you can also decide to add a custom footer for terms, conditions or disclaimers. If you select yes then click next you’ll be taken to a page like the one below where you can include any terms and conditions you see fit. If you’ve followed along so far then you should have chosen a sender, written a compelling message, and added any terms and condition that are applicable. Now its time to add a link to the landing page where you want to send visitors. Then you’ll write a strong call to action and add a banner image. Once you have things looking the way you want them to go ahead and click next to move onto the next step. 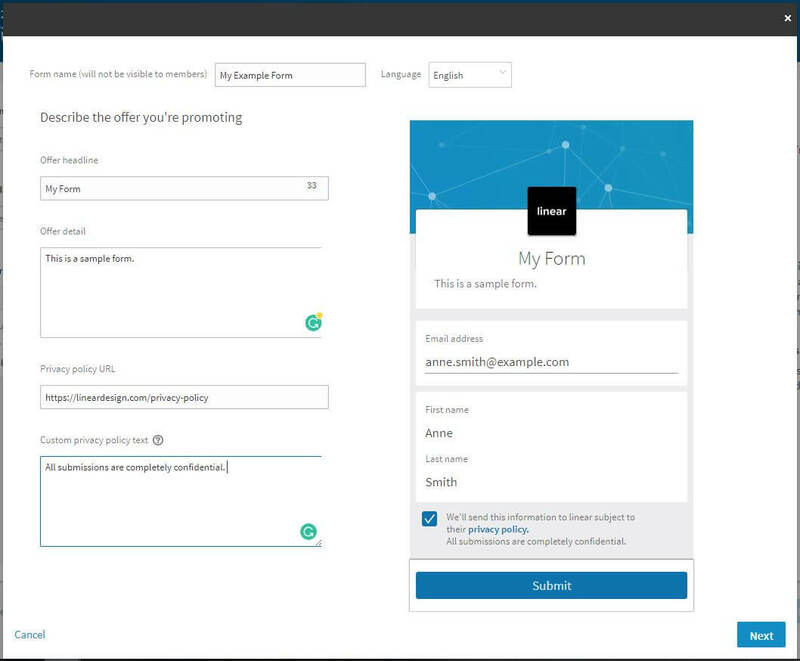 Speaking of the next step, you can skip to Audience Creation to finish creating this campaign or you can keep reading to learn about LinkedIn Lead Gen Forms. Remember how I said each option has its own unique process? Well, that’s mostly true except for the first few steps like selecting a sender and writing your InMail message. They’re pretty much the same. So if you need to scroll back up to review the first few steps then come back to this section when you get to the page asking for your landing page URL. 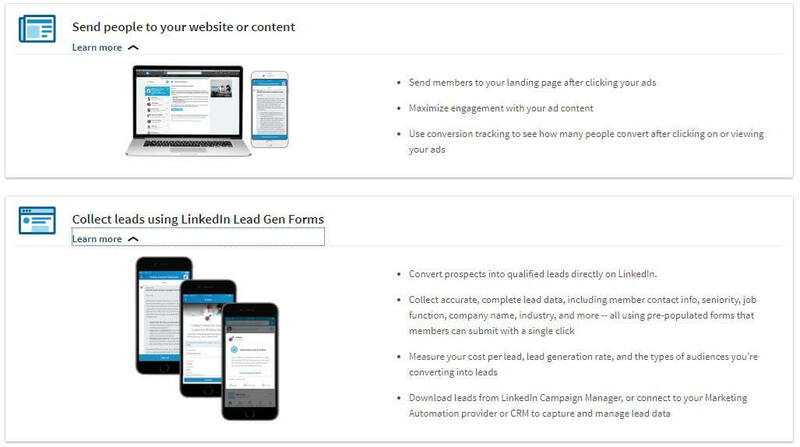 If you’ve chosen to create a Sponsored InMail Campaign and collect leads with LinkedIn Lead Gen Forms then you should be looking at a page fairly similar to the one pictured below. You’ll notice the key differences are the Form template section and the blue ‘Create new form template’ text just below the dropdown. If you’ve already created a form template then you can pick one from the dropdown and click next to continue. However, if you haven’t created a form template you’ll need to create one before you can continue. To begin creating your new form template click on the text highlighted in blue that says ‘Create new form template’. Then follow the next four steps to customize your form. In the first step give your form template a name and choose which language you’ll be writing your form in. After you’ve named your new form template you can start filling in the remaining fields starting with your Offer headline. Your Offer headline should be compelling and tell the person filling out your form what they can expect. Once you’ve written your offer headline try to expand on it in the Offer description box. A good description gives users more details and information that supports the Offer headline. After you’ve completed all the fields on this page click the blue ‘Next’ button to continue. In this section, you can use the checkboxes to select what information you want to collect from users. 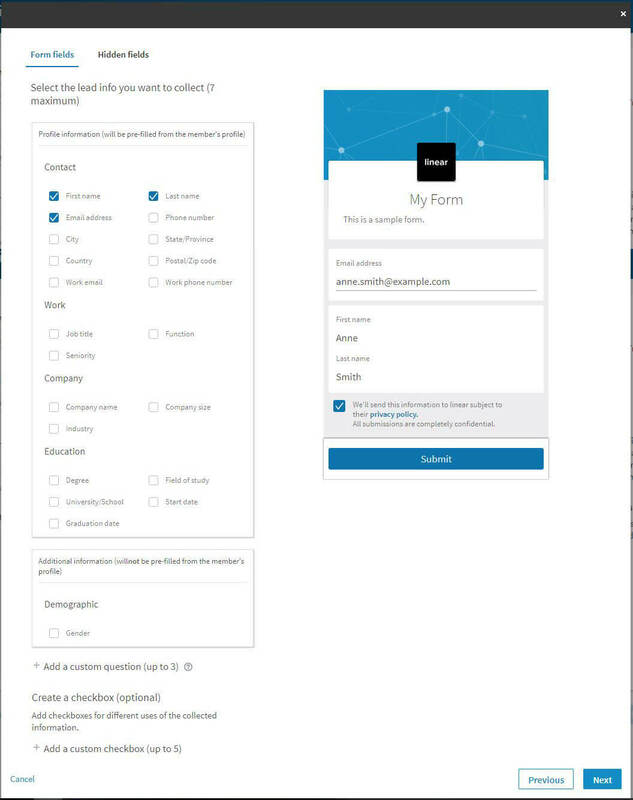 LinkedIn will automatically prefill the form with users information. You can choose up to seven, but its recommended to stick to 3-4 at least to begin with. Later on, you may want to experiment with adding more or fewer form fields to see which performs best. You can also add up to 3 custom questions and up to 5 custom checkboxes. However, additional information will not be prefilled like the other items on the list. When you’re done adding items to your form you can doublecheck the preview to the right to make sure everything checks out. If all is well, then click on the tab titled ‘Hidden fields’ to continue. Hidden fields allow you to track additional information about people who submit your form. Members won’t see these fields hence the name hidden fields, but they will operate in the background to send you information. 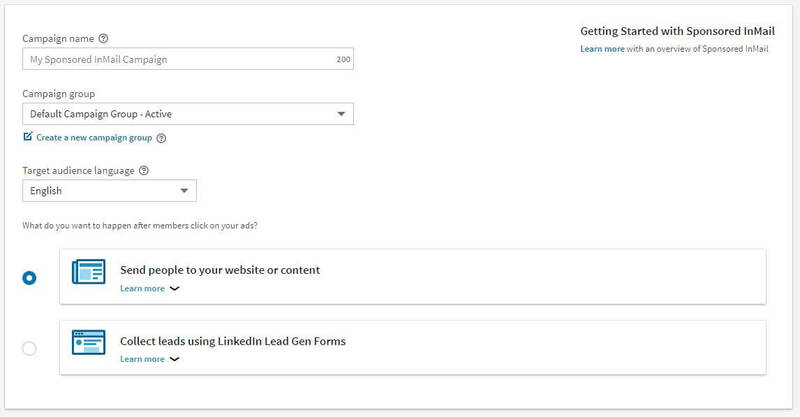 Check out LinkedIn’s official guide to learn more about adding hidden fields to a Lead Generation Form. As the title reads this section is dedicated to customizing the page users will see after they submit your form. This is often overlooked as unimportant, but you’re leaving a lot on the table if you don’t take some time to create a good thank you message. In this section, you’ll start by writing a short thank you message. Try to make your message warm, friendly, and reassuring. Let users know what to expect and when to expect it. Then, of course, make sure you deliver on your promises. Next, add a link to your website and choose one of the three available calls to action. Don’t be afraid to test out different CTAs on your thank you page as long as you keep them relevant of course. This is especially useful if you have another offer for prospects to convert on like an eBook or Free Trail. Now that you’ve created a form template you’ll be able to select it from the dropdown as seen below. Well, that’s all she wrote for Sponsored InMail Ads, oh except for the final two steps. Yep, there’s still a few more steps you’ll have to complete before you launch your LinkedIn Ads Campaign. So don’t be falling asleep on me yet you’re almost there! Remember how I told you LinkedIn Ads really upped their game. Well now you know I wasn’t kidding! You can retarget past website visitors, upload a contact list for retargeting, or choose from specific targeting criteria. After you’ve made your audience selections LinkedIn even displays your estimated audience size in the right column. In the screenshot below you can see all of the targeting options available to you. There are so many things you can do during this step we need another article just to cover LinkedIn Audience creation. So for now, let’s do a quick breakdown of the different targeting options available. After installing the LinkedIn Insight tag you can use a matched audience to retarget your past website visitors. You’ll be able to reuse this audience in other LinkedIn campaigns so I recommend using a descriptive name. Next, you can choose what websites or pages to include in your audience. 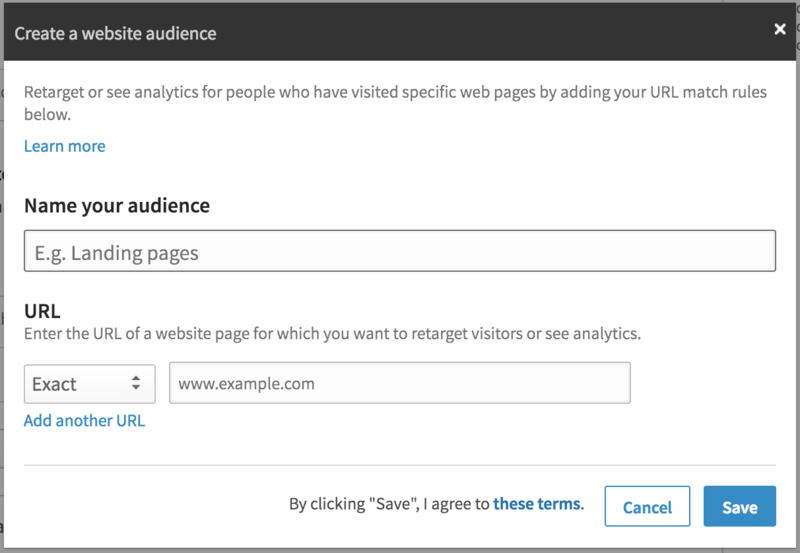 Exact – Target only users who have visited the same URL you enter. This is perfect for retargeting high intent visitors who have visited a specific landing page. Starts With – Target all users that have visited your website or specific sections of your website. This is useful for targeting all of your past website or blog visitors. Contains – Target any user who has visited a URL containing the word or phrase you enter. You can use this feature to retarget users who have visited related pages. You can even add more than one URL and match type. For example, you could include all users that have visited your blog assuming it uses a subdomain or parent-child hierarchy. Before you get ahead of yourself creating different audiences make sure your insight tag is installed and working properly. 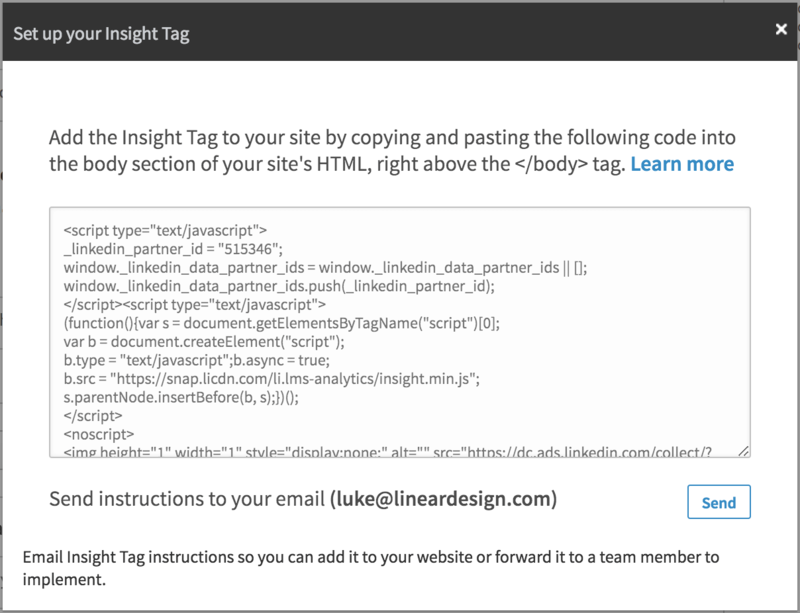 To install the Insight tag just copy and paste the code directly into your website. If you’re using WordPress then your site’s theme may have a section for tracking codes. You can find more information on installing and using your insight tag on LinkedIn’s official guide. If you want to retarget your email list then you’re in luck. Click to upload a list of emails and LinkedIn will match them to users automatically and be ready to go in 24-48 hours. You can add the audience to your campaign immediately, however it won’t serve ads until fully processed. 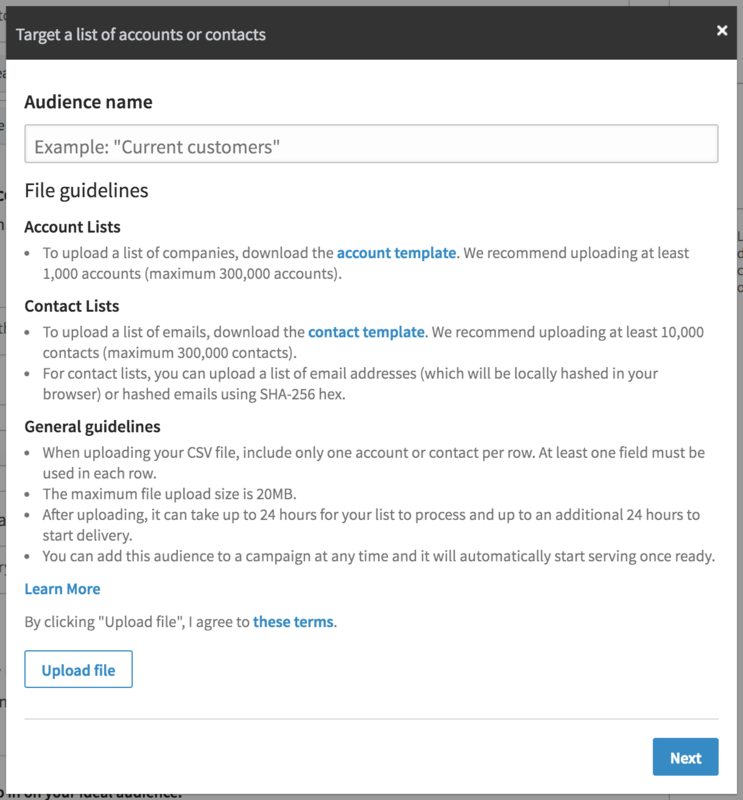 You can learn more by checking out LinkedIn’s official guide to uploading lists for account and contact targeting. Much like Facebook Saved Audiences, you can use LinkedIn Ads to target users based on specific targeting criteria. LinkedIn provides dozens of different targeting options beginning with location targeting. You can target users that live in a specific country, state, city, or town. Additionally, you can use the checkbox to only include people who are permanent residents of the locations you target. This is usually the way to go unless you want people from Nauru clicking on your ads (no offense to anyone in Nauru who might be reading this). You now have sixteen different categories to pick from that should help you target your ideal audience. Once you click on a category a search bar will appear allowing you to pick the subcategory you want to include in your audience. You can select as few or as many targeting options as you like. Just be sure to keep an eye on the size of your audience as too large or too small of an audience may limit your results. Below you can find a list of all of the different targeting criteria available along with the different options for each. Company Name – You can target people by the company they currently work for or companies they’ve worked for in the past. In the same way, you can also exclude people from your audience based on their work history. Company Industry – You can include or exclude over 17 different categories each with dozens of industry subcategories. Company Size – You can include or exclude companies based on the number of people they employ. You can target companies with as few as 11 employees or as many as 10,000+. Company Followers – You can choose to only show your ad to your followers or to exclude your followers from seeing your ad. Company Connections – You can include or exclude the first-degree connections of employees at the companies you select. However, only companies with more than 500 employees are eligible. Job Title – You can include or exclude people by their current or past job titles. If you’re unsure of what titles to use check out LinkedIn’s Title Directory. Job Function – You can pick from 26 different job functions to include or exclude from your audience. Job Seniority – You can include or exclude up to ten different seniority ranges from unpaid and entry-level to owners and VPs. Member Schools – You can include or exclude users from your audience based on the schools they’ve attended. Since you aren’t given the options anyone who’s attended the schools chosen will be targeted regardless of current or past attendance. Fields of Study – You can choose to include or exclude people in various fields of study from accounting to zoology and everything in between. Degrees – You can include or exclude users based on the degrees they hold from Associates degrees to PhD. Member Skills – You can include or exclude users by their skills from Adobe Photoshop to Zumba and everything in between. Years of Experience – You can adjust both ends of the slider to choose between as little as 1 year of experience, as much as 12+ years of experience, or anything in between. Member Groups – You can include or exclude people who are members of specific LinkedIn Groups. Member Gender – After checking the box and agreeing not to discriminate based on gender you can choose to only target males or females. Member Age – After checking the box agreeing not to engage in age-based discrimination you can choose to target people in up to four different age groups: 18-24, 25-35, 35-45, and 55+. 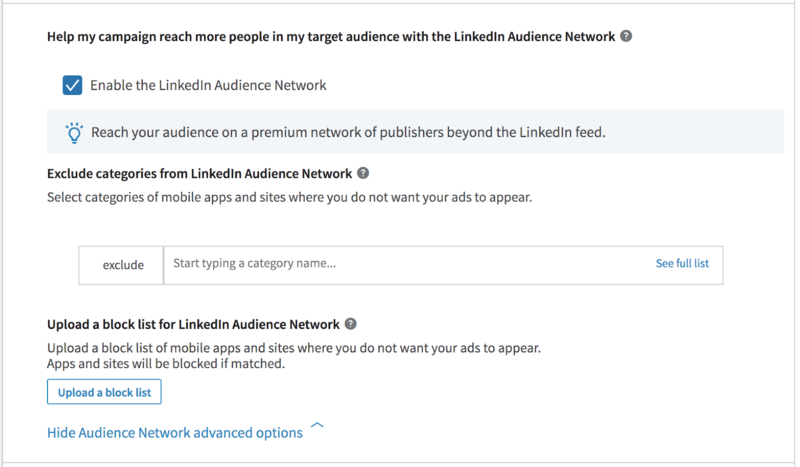 Released to the public on September 6th, 2017 the LinkedIn Audience Network allows you to publish your ads across a large variety of partner sites. According to TechCrunch the LinkedIn Audience Network includes tens of thousands of premium publisher sites and popular ad exchanges like MoPub, Sharethrough, Google Ad Exchange and Rubicon. If opt into the audience network you’ll also be given the option to remove your ad from specific categories. You can choose to exclude a plethora of categories from adoption to waterskiing. You name it you can exclude it. You can also download reports to see how your ads perform across different partner sites and apps. You can check out LinkedIn’s step by step reporting guide for more info. When you opt-in to Audience Expansion LinkedIn will try to show your ad to people with closely related interests to those you selected. 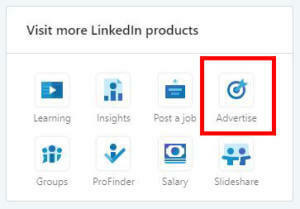 For example, if you chose to target anyone with the skill ‘online advertising’ LinkedIn may also show your ad to people with the skill ‘interactive marketing’ on their profile. Like other types of automation, you can probably see how this could get out of hand pretty quickly. However, you can eliminate any irrelevant expansion by excluding interests that would not fit your target audience. With this in mind, we’ve found this to be an extremely valuable feature on LinkedIn Ads. Specifying your budget and bidding options are arguably the most important part of any ad campaign. In this sense LinkedIn Ads saves the best for last and has you decide how much to spend in the final step before launching your campaign. In this section, you can use the dropdown menu to select one of three campaign goals. You can choose Awareness, Website Visits, or Website Conversions. Depending on the option you choose LinkedIn will automatically optimize your campaign to help you achieve that goal. So you’ll want to make sure you choose the right goal. This could easily be renamed ‘Impressions and Reach’ because that’s really what the platform will attempt to maximize. Your ad will be shown to as many people as possible within your audience. If you choose to maximize website visits LinkedIn will try to show your ad to people in your audience who it believes are most likely to click on your ad. Again, you could rename this goal to ‘clicks’ because that is what LinkedIn will focus on when using this campaign goal. 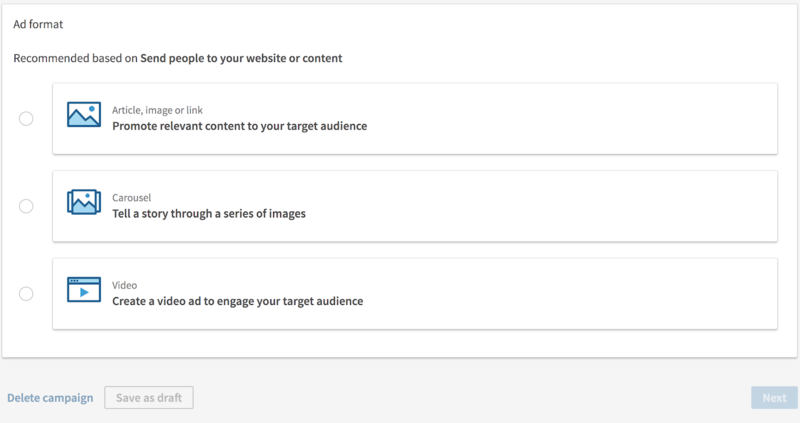 More self-explanatory than the other goal types, this option will try to show your add to people in your audience who are most likely to convert. It does this using data from previous converters so you may see better results over time. Like any smart advertiser, you probably want to see an ROI from your investment in LinkedIn Ads. Which means you probably have some kind of goal you’re hoping to accomplish. Well luckily for you LinkedIn Ads is all about helping you hit your goals. Whether that’s selling a product, service, or just growing your subscriber list you can do it all with LinkedIn Ads. Like other platforms, LinkedIn Ads allows you can track these desired actions in the form of conversions. Ahh yes, the treasured yet often hard to come by conversion. You can use the ‘Select conversions’ button to pick one or more conversions that you want to track. 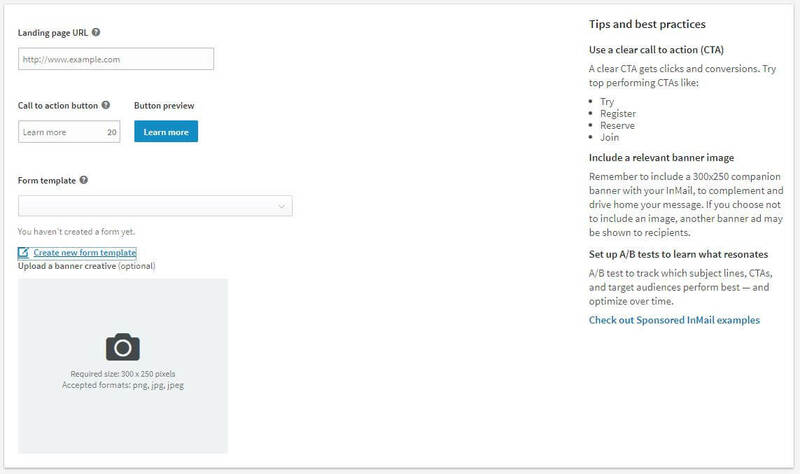 However, in order to use this feature, you’ll need to install the Linkedin Insight Tag on your website or landing page. 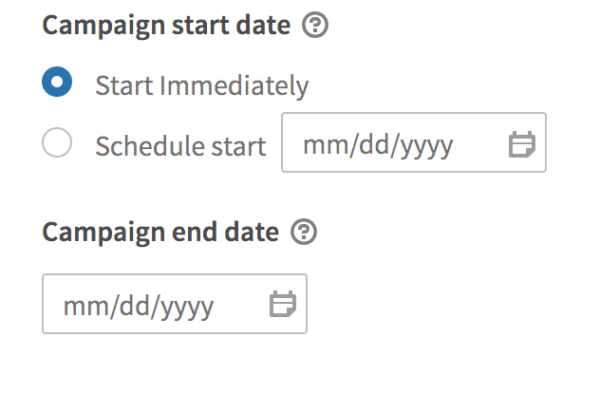 Then you’ll need to sign in to your campaign manager and set up the different conversions you’d like to track. Remember it’s a good idea to track conversions regardless of your campaigns overall goal. So if you haven’t already go set up some conversions you’d like to track before launching your campaign. Unlike other ad platforms, LinkedIn requires a minimum daily budget. The minimum daily budget for most LinkedIn ad campaigns is $10.00 per day unless the minimum bid exceeds that amount, but we’ll get to that later. When setting your daily budget you should also remember that LinkedIn Ads may go over your daily budget by up to 20% on any given day. So it’s important to take that into account before launching your campaign. However, if you have a total budget in mind for your campaign LinkedIn does offer a total budget option as a fail-safe. To set up a total budget click on the blue highlighted text labeled ‘Hide end date, total budget, and ad rotation options’. Then enter the amount you would like as your total campaign budget into the box labeled ‘Total Budget’. This will prevent your campaign from exceeding the total, however, it may prevent your campaign from running its entire duration. LinkedIn Ads gives you two different bidding options. You can select automated bidding to let LinkedIn bid for you or select max CPC bidding to set a bid manually. So how do you decide what bid type is best for you? First, let’s take a more in-depth look at how each type of bid works before we make any rash decisions. Automated bidding uses machine learning to try and get you the best results possible within your daily budget. However, it also charges you by impressions which means you’ll be paying whether you get clicks or not. As you can imagine this could get frustrating pretty fast if you’re not seeing the results you wanted. However, it might still be worth a try. In early beta tests, LinkedIn noted participants that switched to automated bidding saw their ad costs decrease by an average of 30%. So keep this in mind before completely ruling it out. Max CPC bidding allows you to decide how much you’re willing to pay per click or if you selected awareness per 1000 impressions. Setting a maximum CPC bid doesn’t guarantee that you’ll pay the maximum amount each time. It simply means you’ll never pay more than your max CPC bid. This option gives you more control and guarantees you won’t be charged unless someone clicks on your ad. However, depending on the type of campaign you’re running LinkedIn may have a minimum bid requirement. That means you’ll have to set a bid equal to or greater than the defined minimum bid amount. This may also affect your daily budget since it will need to be equal to or greater than your Max CPC bid. Anyway, it’s always a good idea to set a campaign end date and a total budget even if you plan on running the same campaign for a long time. You can always update the campaign end dates and total budget, but you can’t get your money back after it’s been spent. To reveal the option and enter an end date just click on the blue text titled ‘Hide end date, total budget, and ad rotation options’. This setting is also a somewhat hidden one, but if you follow the steps listed in the previous section you’ll reveal the Ad Rotation option. The Ad Rotation option allows you to choose between two different delivery types to test your ads variations against each other. Keep in mind you’ll need to have at least two different ads in the same campaign in order for this setting to apply. Optimize for performance – This option tries to show each ad evenly at first to learn which ad performs best. Then using the data it collects it automatically increases delivery of the winning ad and decreases delivery of the losing ad. Allow ads to enter auction evenly – This option will always try to show each ad an even number of times without taking performance into account. It might be tempting to let LinkedIn do the heavy lifting for you and choose the best performing ad, but often times you’ll see better results monitoring ad performance yourself. Then when you discover a winning ad you can pause the losing ad and begin testing a new variation. This will allow you to continually improve the performance of your ads even over an extended period of time. Some campaigns seem to work better than others, at least for certain things. For example, sponsored content campaigns will generally be the best way to attract blog visitors, relay company news, and drive engagement. They might also help you grow the number of followers on your LinkedIn company page. Text ads are the best way to reach as many people as possible and can also be more effective at driving website conversions for specific offers. Sponsored InMail can be extremely helpful if you’re trying to promote an upcoming event, an eBook, or a training course. Dynamic Ads may be the best way to grow your LinkedIn company page followers, promote an upcoming event, or grow your email list. Ultimately your offer is the most powerful factor that determines your success on LinkedIn Ads or any ad platform for that matter. So if you’re striking out regardless of your campaign or ad format then try switching up your offer. Instead of having your heart set on offering a free consultation, try lowering the threat of your initial ask. Smoke test different offers like downloadable checklists, eBooks, and cheat sheets. Then use a separate campaign to retarget users that have converted on your first offer. They’ll be more likely to convert on your core offering like a free consultation. Like with most other ad platforms LinkedIn Ads come with some recommended guidelines to follow in order to get the best results. Generally speaking best practices aren’t always all they are cracked up to be, but in this case, LinkedIn really nails it. Now that’s not to say you shouldn’t experiment and test new ideas. However, if you’re just starting out you may end up throwing a lot of ad spend away if you don’t follow the rules. With this in mind, I strongly recommend that you do a quick review before you run your first ad campaign. Here are a few of the best practices we’ve found most effective for each type of campaign. Try to keep your ad headlines under 150 characters. Shorter headlines that get to the point typically perform better. Don’t overdo your ad description, 70 characters or less seems to be the sweet spot and anything over 100 characters probably won’t be displayed. Use high-quality images with a resolution of at least 1200 x 627 pixels. Crisp and engaging visuals will increase your click-through rate and improve your results. For the official list of best practices and tips for sponsored content campaigns, you can check out LinkedIn’s Sponsored Content tips. Use a designated landing page that matches your ad’s message. This will increase your conversion rate and drive higher quality leads. Make sure your landing page is mobile friendly and only uses one call to action (CTA). Pick a location and two other targeting criteria to start, and be sure to follow ad targeting best practices. You can find even more ideas and advice on LinkedIn Text Ads tips. Use only one CTA in each dynamic ad and make sure the language is clear and easy to understand. If you’re trying to attract more followers with Dynamic Ads then be sure to exclude your existing followers from your audience. When creating Spotlight Ads make use of the optional background image in one of your variants to see if it improves performance. If you want more guidance on using dynamic ad then check out LinkedIn Dynamic ad tips. It’s tempting to write a novel, but try to keep it short and to the point, remember these are busy people. Aim for 450 – 550 characters or about 100 words or less. Take advantage of LinkedIn’s wide range of personalization features like the ability to insert the users first and last name into your greeting. Insert links back to your website that would be relevant to your target audience and help you reach your goal. According to LinkedIn messages with links in the body can lift click-through rates (CTR) by as much as 21%. Check out LinkedIn’s official guide for even more Sponsored InMail tips. At this point, I think its safe to say that LinkedIn Ads is every bit as robust and as other social ad platforms. Especially with their latest upgrade that is soon to be released. 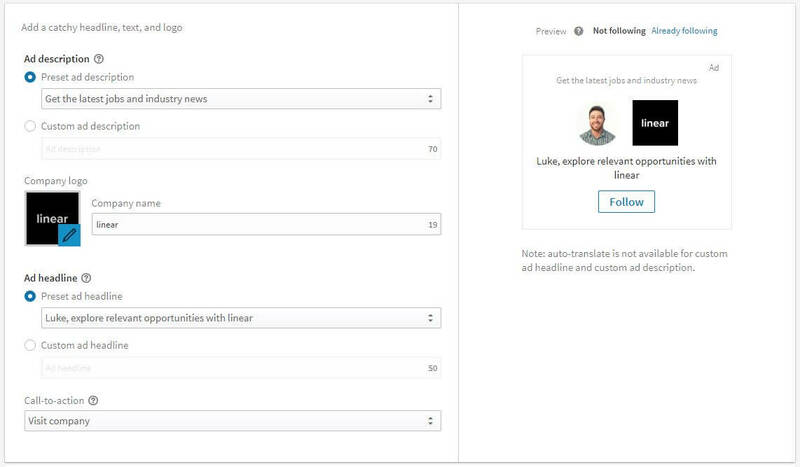 It’s still in beta testing at the moment but make sure you watch for LinkedIn’s new objective-based campaign creation. Alright, its time to wrap up this guide to LinkedIn Ads. If you actually read this entire article then give yourself a pat on the back you’re officially a black belt in LinkedIn Ads. If you see something we missed or you have some tips to share then leave them in the comments below. If you have questions about your LinkedIn Ads or need some help make sure you fill out a proposal request. Luke is in love with all things digital marketing. 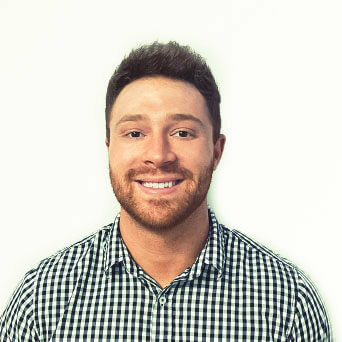 He’s obsessed with PPC, landing page design, and conversion rate optimization. Luke claims he “doesn’t even lift,” but he looks more like a professional bodybuilder than a PPC nerd. He says all he needs is a pair of glasses to fix that. We’ll let you be the judge.